Please refer to our stock # GT.mimi when inquiring. "MIMI" ('mimi" is the Japanese word for "ears. 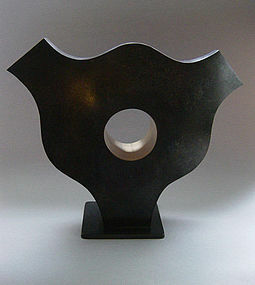 ")Sculpture, bronze fabrication with patina, Gerard Tsutakawa, 2001. H.12"(30.5cm) x W.10.25"(26cm) x D.4.375"(11cm). Gerard is a 3rd generation Japanese-American and a 2nd generation artist. His father's name, George Tsutakawa, is nearly synonymous with the word "sculpture" in the Pacific NW region. Gerard worked in his father's studio, learning to fabricate large bronzes and fountain sculptures. He was a student and apprentice to his father, and his engineering advisor Jack Uchida. His early works were explorations of abstract expressionism, following the freedom of design it allowed, tempered with a sense of balance found in the natural world. In 1975, he was part of a group of young artists who founded, managed, and staffed Cicada Gallery in Seattle's International District. His first sculpture show was there in 1976. The next 12 years were spent continuing to work with his father and also creating his own work. From the mid-1980's on, Gerard was engaged in producing several public fountain sculptures, with the work growing larger in scale. He has several recognizable works around the region including the "Mitt" at Safeco Field (home of the Seattle Mariners Baseball Team,) "Sentinel" at the Seattle Center, a new gate at Kubota Gardens, and many more. He has also been making smaller works, trying to boil down gist in their compactness. They are inspired by a sense of simplicity that radiates beyond their bantam scale. His newest works tend to draw from the natural forms and the human spirit, while still abstract and inspired by allegorical themes. As both a studio artist showing in galleries, and as a public artist; he realizes the challenge of creating work that reaches and lives with audiences of varying sizes. Artist Statement: "My major goal and challenge has always been to search for a clear and coherent essence in the sculpture shapes. By following the principle of less is more I try to impart a timeless intrinsic strength to these artworks. My sculptures reflect my desire to create images that are so string that their appeal does not diminish with time. I am a studio artist and continue to show my work in gallery spaces. I am also a public artist. This presents the challenge to create sculptures and artworks that live with a larger audience. The dilemma is to design sculptures that are met with critical acclaim and can be enjoyed by many, not just art enthusiasts. Working in public art, I feel that it is possible to reach the young and old, the rich and not so rich; to create art that can be enjoyed by all."